All the kitchen secrets, techniques, recipes, and inspiration you need to craft transcendent cocktails, from essential, canonical classics to imaginative all-new creations from America's Test Kitchen. Cocktail making is part art and part science--just like cooking. 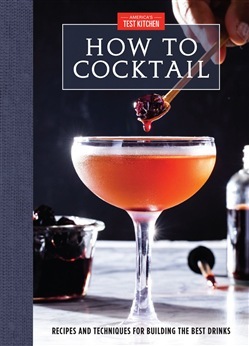 The first-ever cocktail book from America's Test Kitchen brings our objective, kitchen-tested and -perfected approach to the craft of making cocktails. You always want your cocktail to be something special--whether you're in the mood for a simple Negroni, a properly muddled Caipirinha, or a big batch of Margaritas or Bloody Marys with friends. After rigorous recipe testing, we're able to reveal not only the ideal ingredient proportions and best mixing technique for each drink, but also how to make homemade tonic for your Gin and Tonic, and homemade sweet vermouth and cocktail cherries for your Manhattan. And you can't simply quadruple any Margarita recipe and have it turn out right for your group of guests--to serve a crowd, the proportions must change. You can always elevate that big-batch Margarita, though, with our Smoked Rim Salt or Sriracha Rim Salt. How to Cocktail offers 125 recipes that range from classic cocktails to new America's Test Kitchen originals. Our two DIY chapters offer streamlined recipes for making superior versions of cocktail cherries, cocktail onions, flavored syrups, rim salts and sugars, bitters, vermouths, liqueurs, and more. And the final chapter includes a dozen of our test cooks' favorite cocktail-hour snacks. All along the way, we solve practical challenges for the home cook, including how to make an array of cocktails without having to buy lots of expensive bottles, how to use a Boston shaker, what kinds of ice are best and how to make them, and much more. Acquista How to Cocktail in Epub: dopo aver letto l’ebook How to Cocktail di ti invitiamo a lasciarci una Recensione qui sotto: sarà utile agli utenti che non abbiano ancora letto questo libro e che vogliano avere delle opinioni altrui. L’opinione su di un libro è molto soggettiva e per questo leggere eventuali recensioni negative non ci dovrà frenare dall’acquisto, anzi dovrà spingerci ad acquistare il libro in fretta per poter dire la nostra ed eventualmente smentire quanto commentato da altri, contribuendo ad arricchire più possibile i commenti e dare sempre più spunti di confronto al pubblico online.